1University of Warwick, 2University of Birmingham, 3Yale University. The Sun’s magnetic field, which varies primarily on a timescale of 11yrs, originates in the solar interior and so can be studied using helioseismology. The recent solar minimum between cycles 23 and 24 was deeper and longer than anyone expected. In a recent paper, Basu et al. use helioseismology to show that it was not just the minimum between cycles 23 and 24 that was unusual. In fact, the Sun was behaving strangely for the majority of cycle 23 and so, in hindsight, the recent unusual solar minimum could have been predicted. Helioseismology uses the Sun’s natural resonant oscillations to probe conditions in the solar interior. Thousands of acoustic oscillations (p modes) are trapped within well-defined volumes of the interior and are sensitive to conditions inside the Sun. By studying properties of the oscillations, such as their frequencies, it is possible to gain insight into, for example, the temperature, rotation, and compositional profiles of the solar interior. The strength of the internal solar magnetic field also influences the oscillations. It is well known that p-mode frequencies vary between solar minimum and maximum (, , ), with the frequencies being at their largest at solar maximum. A low-angular-degree (low-l) mode with a frequency of 3000µHz experiences a shift of about 0.4µHz between solar minimum and maximum. By studying the variation of the p-mode frequencies through the solar cycle we can learn about the structure and evolution of the Sun’s internal magnetic field. 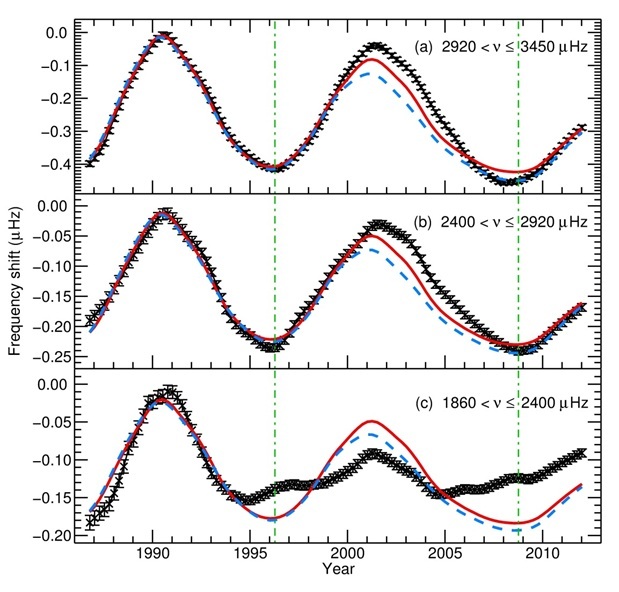 Here we examine data observed by the Birmingham Solar Oscillations Network (BiSON). BiSON makes Sun-as-a-star (unresolved) Doppler velocity observations, which are sensitive to the p modes with the largest horizontal scales (or the lowest l), in particular l = 0, 1, and 2. Consequently, the frequencies measured by BiSON are of the truly global modes of the Sun. These modes travel to the Sun’s core, but their dwell time at the surface is longer than at the core because the sound speed inside the Sun increases with depth. Therefore, the low-l modes are also very sensitive to variations in regions of the interior that are close to the surface and so are able to give a global picture of the influence of near-surface activity. Figure 1: Smoothed average frequency shifts of solar oscillations observed by BiSON, as a function of time for three different frequency ranges. The plotted shifts were calculated with respect to the averaged frequencies during the cycle 22 maximum (October 1988 to April 1992). Black points in each panel show the average shift in frequency. The red line is the 10.7 cm flux, and the blue line is the International Sunspot Number (ISN), both scaled to match the frequency shifts observed during the maximum of cycle 22. The vertical lines mark the epochs of solar activity minimum. Figure 1 shows the smoothed average shift in the frequencies of solar oscillations as a function of time. The frequency shifts were smoothed to remove a quasi-biennial signal in the data (see previous nugget). Overplotted on the same figure are the 10.7cm flux and the International Sunspot Number (ISN), scaled to match the frequency shifts observed in cycle 23 (approx. 1996-2009). Note that in cycle 22 (approx. 1986-1996), the frequency shifts and the two proxies were in lockstep. However, in cycle 23 the frequencies and the two proxies deviated from one another. The deviations became particularly large on the descending phase of solar cycle 23, and in the minimum that followed. In fact we can say that the low-frequency shifts began to behave strangely from the very onset of cycle 23, thus indicating that the peculiarity in the solar cycle started long before the solar minimum. In other words helioseismic signatures were already present during cycle 23 which indicated that the Sun was behaving in a way that was different from the previous cycle. With the benefit of hindsight, these signatures could have been a warning of an unusual minimum to come. 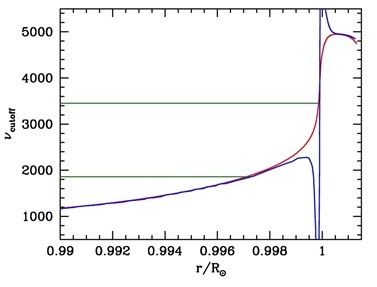 Figure 2: The acoustic cut-off frequency (blue) that approximately defines the upper turning point of oscillation frequencies of a standard solar model plotted as a function of radius. The curve in red is the same quantity calculated in the isothermal limit. The green lines represent frequencies at 1860μHz and 3450μHz. Note that the lower frequency mode is reflected deeper inside the Sun. Modes with different frequencies are reflected back into the Sun at different heights in the atmosphere and modes have very little sensitivity to the layers beyond this radius. The layer at which a mode is reflected back is usually referred to as the upper turning point and this happens at the radius at which the acoustic cut-off frequency of a star equals the frequency of the mode, i.e., where &#957ac=&#957 (see ). Figure 2 shows the variation acoustic cut-off frequency with depth for a standard solar model. As can be seen from this figure the low-frequency modes do not penetrate above about 0.997R⊙. The high- and medium-frequency modes turn closer to the surface. The high- and medium-frequency modes showed clear cycle-dependent frequency shifts during both cycle 22 and cycle 23, while the low-frequency modes showed more modest variations during cycle 23, and strong frequency variations only during cycle 22. So, we can conclude that the upper turning points of the low-frequency modes lay within the layer of the Sun that was responsible for the changes in behaviour during cycle 22 but beneath the layer of the Sun that was responsible for the changes in behaviour during cycle 23. This could imply that the magnetic layer responsible for the change in frequency with time was more restricted in cycle 23 than in cycle 22 and more specifically, in cycle 23, was situated above 0.997R⊙, or about 2000 km below the surface. An alternative explanation is that the width of the magnetic layer remained the same in cycles 22 and 23 but the upper turning points of the low-frequency modes were deeper in cycle 23 than in cycle 22. Finally we note also that the frequency shifts seen in the low-frequency band are not at the low level seen at previous minima. We can perhaps conjecture that there is some trapped flux that is unable to make its way to the surface; however, this requires further investigation. S. Basu, A.-M. Broomhall, W.J. Chaplin, and Y. Elsworth, 2012, ApJ, 758, 43. M. F. Woodard and R. W. Noyes, 1985, Nat., 318, 449. Y. Elsworth, R. Howe, G. R. Isaak, C. P. McLeod, and R. New, 1990, Nat., 345, 322. K.G. Libbrecht and M.F. Woodard, 1990, Nat., 345, 779.